The invention of the Polish engineer Stanislaw Wosinski consists in increasing the resistance of the organism to the negative factors to health. It especially acts upon the negative influence of the electromagnetic waves and improves the efficiency of the operation of the immunological system, as well as this of blood circulation. Actually, it contributes to reinforce the constitution of the body. More and more often is our attention focused on the threatening nature of the electromagnetic radiations generated by the various devices used in our everyday life, such as computers, mobile phones, microwawe ovens, etc. These radiations can damage, among others, significant organs such as the crystalline lens of the eye, as well as the cerebral cells (emergence of cancerous tumours). To particularly sensitive people, such radiations can cause sleep disorders as well as vascular problems. It has the shape of a disc of an equal diameter to that of a one franc coin, will never run out of battery as not needing any external power supply. It can then remain operational throughout many years, provided that it does not suffer any mechanical damage. The omnipresence of the electromagnetic radiations has spread, and nobody is nowadays able to avoid any contact with them. People most exposed to the action of the electromagnetic waves are particularly those who spend a lot of time in front of their computer's screen, who frequently use electrical appliances, as those who sit too close to their television set, or who live too close to high-tension wires, mobile phones' users, etc. The ADR Protect does not limit in anyway the emission of such devices' radiations. It exerts its action on the human being by increasing its resistance to the negative influence of this kind of radiations. 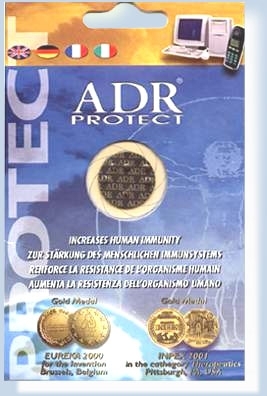 The ADR Protect has performances varying according to people. But in all cases, it limits the bioenergetic disturbance at the time of a communication by mean of a mobile phone without however cancelling it, and thus decreases the time of recovery after a communication. 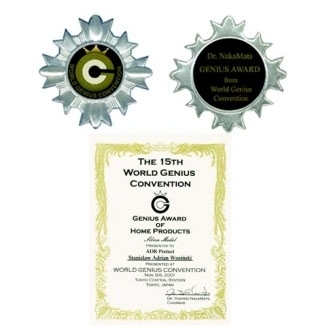 This protection applies to all forms of electromagnetic harmful effects. In order that it can work in the best and powerful way, it is recommended to put the device the closest to the body. Where it will be placed is thus not in itself an important factor. It can either be placed under the sole of a shoe, be stuck under a wrist-watch or on the back of a mobile phone, on the mouse of a computer or, quite simply, put in the pocket of a clothing. ADR-Protect is a medical device under the Medical Devices Directives 93/42/EEC classified as a Class I Device - E10, Rehabilitation Equipment in accord with the European Union legal requirements and is registered in the UK with the Medicines and Healthcare products Regulatory Agency under the number : CA-007844. 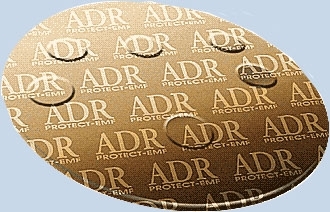 ADR-Protect has a CE mark. The inventions of this Polish engineer have won international prizes of great prestige. 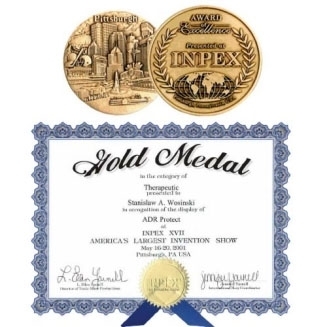 To date, the ADR Protect gained the Gold Medal of the World Innovations Show EUREKA 2000 (Brussels, Belgium), the Gold Medal in the "Therapy" category at the International Exhibition of Technical Innovations INPEX 2001 (Pittsburgh, the USA), the Silver Medal in the " Domestic Articles "category at the 15th Geniuses' Conference 2001 (Tokyo, Japan). Below some data from the World Health Organization WHO - it is interesting that WHO is taking time out their busy schedule to produce REPORT on EMF, ELF.. .......While the enormous benefits of using electricity in everyday life and health care are unquestioned, during the past 20 years the general public has become increasingly concerned about potential adverse health effects of exposure to electric and magnetic fields at extremely low frequencies (ELF). 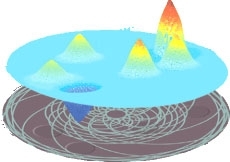 Such exposures arise mainly from the transmission and use of electrical energy at the power frequencies of 50/60 Hz.